There’s nothing like a donut to bring two people together. I brought my truck in for a long overdue oil change yesterday. My five year old son came with me and we decided the one hour wait would be a perfect opportunity to visit the donut shop next door. We hustled in from the cold and ordered up a couple of hot chocolates and sweet treats. I invited my little man to choose our table and he pointed toward a two-top in the far corner. The space felt noticeably peaceful. Nearby three old men sat reading the paper, enjoying a warm ray of sunlight shining through the floor-to-ceiling windows. We smiled at them as we passed and I followed my son to the corner, listening to the quick, rhythmic shoosh-shoosh-shoosh of his snow pants he walked through the quiet shop. He was not interested in conversation. He pushed his cocoa aside and turned his focus on the awaiting spongey delight. I decided to stop talking and simply enjoy the sight of my little guy wholly engaging in an exquisite eating meditation. With deep concentration he examined his snack on the table. He picked it up and sunk his teeth in. When a tiny red jimmy toppled onto his napkin, he pinched it between his thumb and forefinger and meticulously nestled it back into the icing. He chewed and paused and chewed some more. 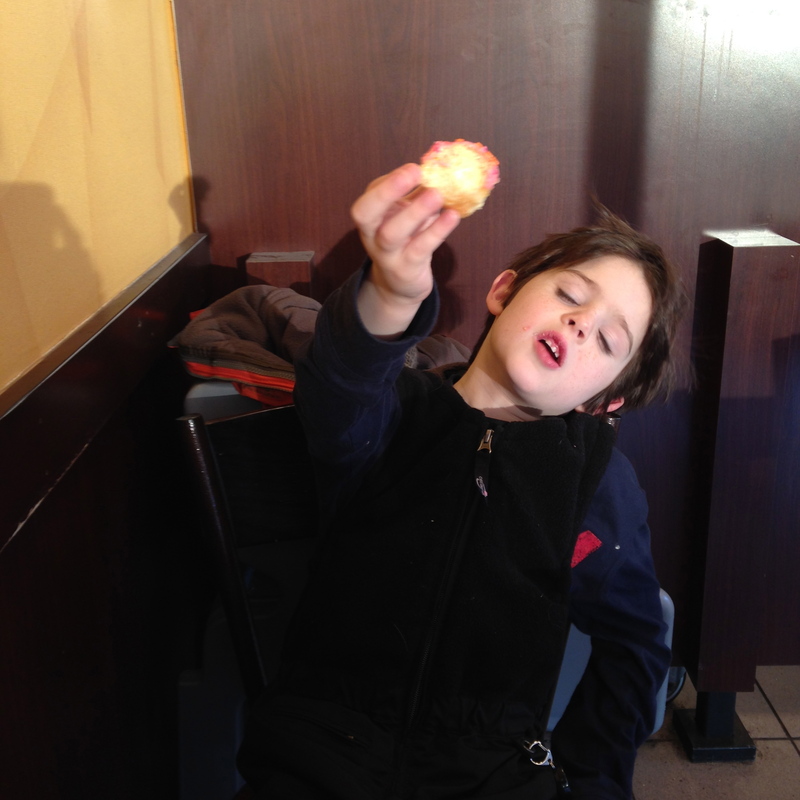 He lifted the donut high above his head with one hand, clearly in awe of its deliciousness. He held it up to me as if to say, Look, Mamma, isn’t it beautiful? But he didn’t utter a word. 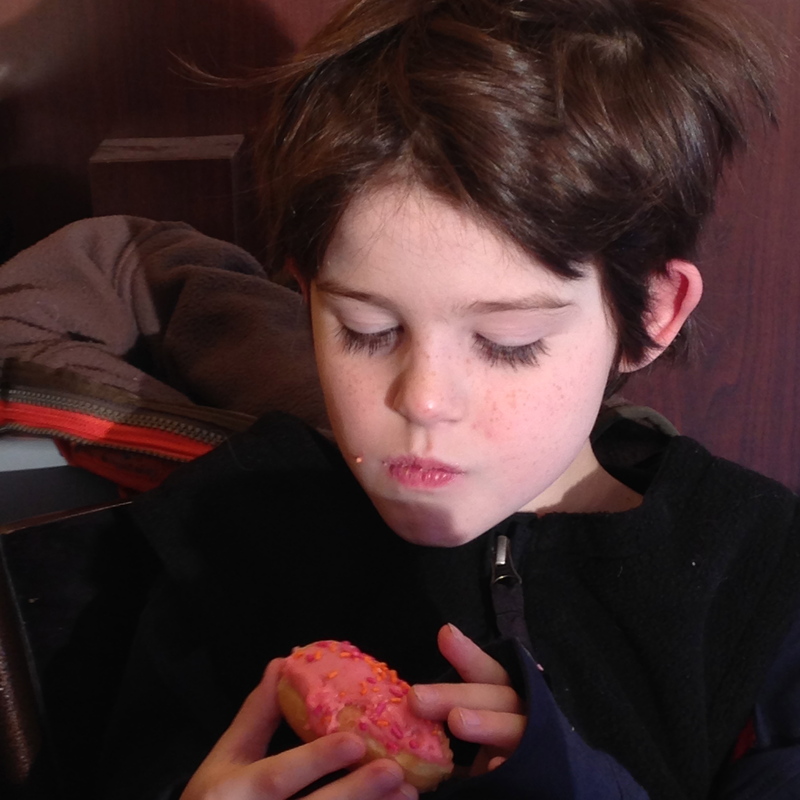 He just returned his full awareness to the slow and methodical extinction of one pink donut. He carefully selected which portion to bite, mindful to save the sweetest bit for last. He chewed and relished and appreciated the donut so entirely, I could only imagine that for him, in those moments, not one other thing existed in the whole wide world. The last bite was upon him. 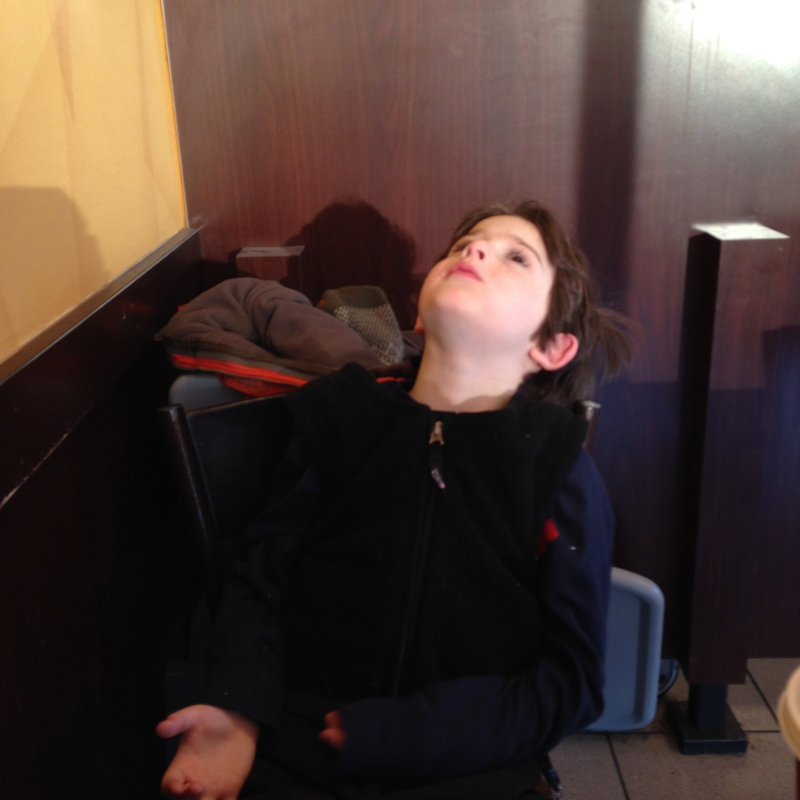 He popped it into his mouth, chewed for a long while, swallowed, then tossed his head back in the chair, staring at the ceiling, seemingly reconciling the experience. I paused to take in the warm hush of the donut shop. And I realized that silence is a pretty amazing way to communicate. I smiled then laughed out loud. I told him I loved him. “I love you, too, Mamma,” he finally responded. It’s a quiet evening in the Gobes household. The autumn sun sets early as the rich aroma of Barefoot Contessa’s boeuf bourguignon peaks our appetites. With a click of the mouse, my cozy, quiet, comfort-food kitchen is suddenly infused with emotion as my family quickly transitions from hunger to contemplation to tears to determination to inspired action. My children and I are wrapped around the sound of a news story aired by NPR online, brought to living color by Paula Bronstein’s stirring photo of a Filipino expressing his raw suffering after Typhoon Haiyan. For a long moment we four are suspended in stillness as we connect with his suffering. His tears flow through our eyes as we watch the computer screen in silence. I break the hush and spend a few minutes talking about what it means to be human. This man is a stranger. He is thousands of miles away, but his pain is as familiar to us as our own breath. My youngest children are 9, 7, and 5. They know suffering, or at least they think they do. Their low points are dredged up by missing sneakers on gym day, by two green brussel sprouts on a dinner plate. But their imaginations are fertile and their capacity for compassion is immense. They examine the man’s expression and begin to list emotions he might be feeling. They, too, feel those things. They connect the dots. He’s just like us. “How can you help him?” I ask. “We can send him blankets!” suggests one. “Maybe the best way to help him from so far away is to raise money. He can use it to import what he needs,” I suggest. “Can we color him a picture, Mommy?” my little one requests. My 9 year-old seems to be experiencing a paradigm shift. She picks up the house phone and begins to dial with great urgency. She’s recruiting her besties to lead a fundraising effort – a good old fashioned coin collection. Empty your piggy banks, fellow third graders! The people of the Philippines need our pocket change! She disappears into her bedroom, chittering quickly, hashing out details and coordinating collection locations. My 7 year-old has settled back into her book Big Nate, but upon absorbing her big sister’s charitable enthusiasm, she ditches the read and picks up a marker. “How do you spell typhoon?” She churns out several posters as I type emails to friends soliciting support for the children’s mission. My 5 year-old is on the edge. He’s constructing cannons out of Tinker Toys and monitoring the commotion cautiously. “Mommy,” he ventures, “Can I ask Jack and Billy to give quarters to that man?” I respond in the affirmative and hear his barely audible, “Yessssss.” He continues to quietly play with his cannons. “Good,” he mutters, not lifting his head. But I can see past his long bangs that he’s smiling. The enthusiasm for this project is contagious. Big sister returns to the kitchen, placing the cordless on my desk. The plan is a go. The primary players are enlisted. 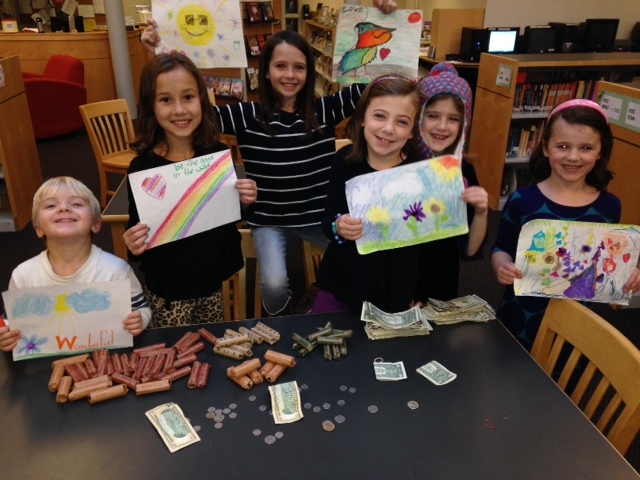 We decide to collect change until Thanksgiving and have a coin counting party on #GivingTuesday. They’re excited to be part of such a special day. Dinner is hot and it’s time to eat. I take a moment to reflect. In the time it took a pot of stew to boil, my children adopted a cause and took action. I’m reminded of a quote by Seneca, “It’s not that we have a short time to live, but that we waste of a lot of it.” No wasted time here. Giddy-up. A few of the kids sorting, counting, stacking, and rolling today. They pulled in $450 in pocket change for the survivors of Haiyan! They feel very accomplished and their moms feel very proud! 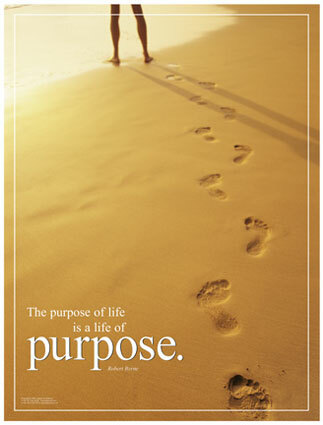 everyone needs purpose. the longer i live, the clearer this becomes to me. in my day-to-day actions and interactions, i try my best to be mindful of intent. intention is key to growth. if you can’t define what you want and why, how will you get anywhere? and if we hope to live a full and enriching life, doesn’t it make sense to set a large-scale intent? we can do so through discovery of purpose. if you are stuck, try numerology. it is such a terrific resource. i use numerology to confirm my purpose, my gifts and my challenges. and i was amazed how accurate my charts were and how neatly these numbers brought clarity to my ever-questioning mind. honestly, the numbers pointed to things i already knew about myself. but they provided me with a vote of confidence and great game plan. i’m in transition between my 7 pinnacle and my 3 pinnacle. pinnacles are areas of particular strength over a period of time. the 7 pinnacle, present for me between ages 27 and 36, is indicative of a time during which i committed myself as completely as i could to study. i had an intense desire to master a subject, which is dead on. i ate, breathed, slept spirituality. loved loved loved it. and i still do. the pinnacle periods are peaks, not chronological limitations. between the ages of 37 and 45, i’ll be experiencing my 3 pinnacle which is a time for the limelight. this is a period during which i will have heightened creativity and crave lots of social interaction. again, these are qualities i’ve had for a long time. i’ve always been a creative person with a big personality. during this time i will need to remind myself that these are the gifts god has given me and i should not apologize for them. i will use these gifts with the best intention. these strengths are umbrellaed by the number 9, my life path number, which represents my life’s purpose. the 9 energy is that of humanitarianism. the 9 must serve a cause bigger than the self. the 9 is big picture, self-sacrificing. so i can find peace, balance and synchronicity in this life by using my gifts to serve human kind. does your kid have superpowers? Some superheroes wear capes and masks, crested unitards and holsters packed with magical tools. But there’s another kind of superhero. The kind that wears smocked dresses with patent leather Mary Janes or grass stained jeans and Red Sox caps. My kids are the latter kind. At least I’ve always told them so. When they were tiny I’d tell them that they were born with superpowers: the power to make people feel good by showing kindness and forgiveness, the power to end sadness by sharing their toys and offering a helping hand. One day ages ago, I was at the splash park in Belmont with my daughter and her friend. The girls were whispering and pointing at a woman across the water wearing a beige burqa, black gloves and purple Merrells. Her face was veiled, just her eyes were visible. Those eyes were focused intently on her baby girl splashing playfully and wildly in the same pool as my crew. “I’m afraid of her. She’s a stranger,” said my daughter’s wide-eyed friend, laying eyes on a fully covered Muslim woman for the first time. “No, no, she’s not scary. Let’s go say hi to her and she won’t be a stranger anymore.” The girls looked at me like I was totally insane. They resisted and skidded as I grabbed their rigid slippery hands and sloshed across the puddles. As we approached, the Muslim woman was chatting on her cell phone. “Purple and turquoise and orange and yellow. And pink,” said one girl. “Rainbow and pink,” said the other. The girls asked a few intrusive questions, as kids do, and I thanked her as we splashed away, figuring out which superpowers we’d just activated. “The power of friendliness!” my daughter shouted, bounding over a shooting stream of cold water. “The power of fearlessness!” I cheered. “The power of pink!” laughed her friend. Then we extended our list of superhero garb to include bathing suits, aqua socks and burqas. Please read this story with children in your life who have superpowers. Tweet, pin, tumble and share wildly, please. Thank you! 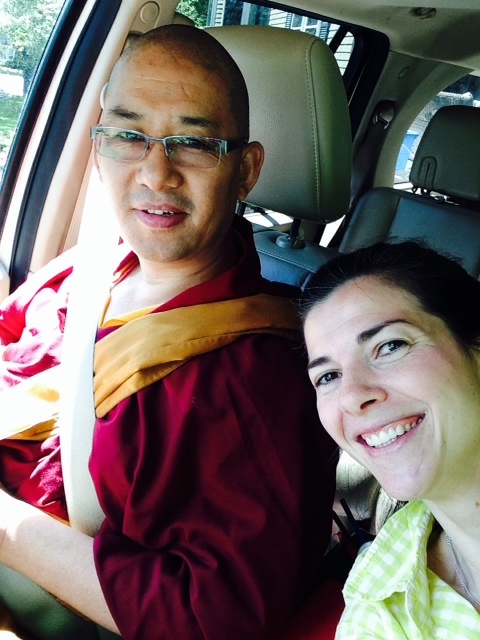 looks like it’s become inspiration week on bringingupbuddhas. i guess this is what i’m needing. maybe you are, too. The family was playing a hot game of Monopoly Tuesday night. At one point during the game, we stopped to assess the board. My youngest was in jail, where he had spent the growing majority of his turns. He hadn’t passed GO in about 8 rolls. My middle daughter was banker, maintaining complete control of money, properties and building projects. The number one requirement for her job seemed to be fuzzy math. My oldest sat back and sniffed her putty colored hundreds while building hotels from Mediterranean to Connecticut Avenue. A slum lord in the making. I couldn’t help but look at this scenario and laugh about it in relation to my month’s spiritual work – acceptance of life as it is, the gentle guidance of my children toward peace and collaboration, the release of bearing the burden of their shortcomings and mistakes. 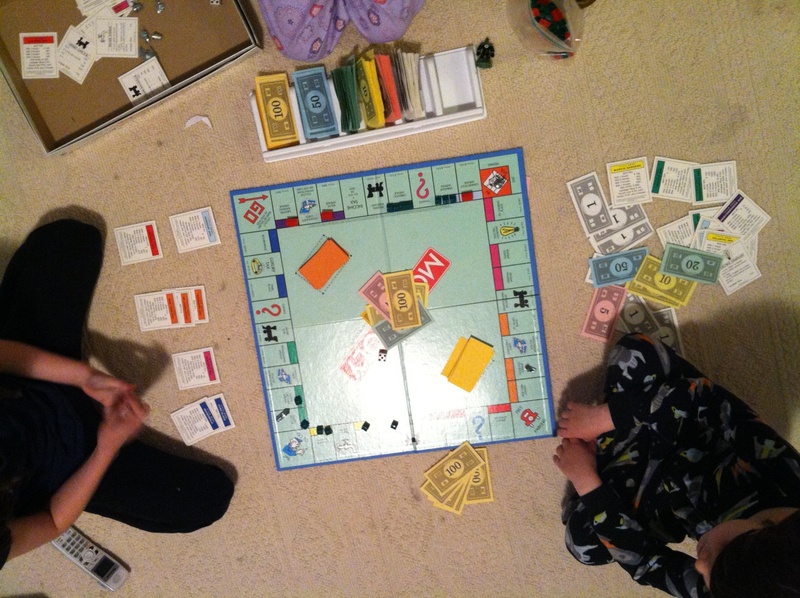 In 30 years, if my kids are incarcerated, corrupt and amoral, I’m going to blame it on Monopoly.